POGS go to finish., Здається закриється ще один проект (все пораховано). As a lot of you noticed, there haven't been any workunits for POGS for about a week. I've been told by Kevin this morning that POGS has finished processing all the galaxies he needs. Next up, we'll be looking at reviewing all of the processed galaxy data and preparing it for actual use. Kevin tells me that the next step is to use the processed galaxy data to train an auto-encoder neural network to classify galaxies based on their features. We'll have a gigantic amount of training data ready for this task, so the prospects of positive results seem high. Additionally, any research papers that ICRAR publishes using this data will contain an acknowledgement to the work done by everyone who contributed to POGS. The POGS and theSkyNet websites are going to remain up for the time being, but Kevin is also looking to shut them down once everything has fully wrapped up. This is mainly due to monetary issues - it costs more than $2,000 AUD per month to keep the POGS and theSkyNet services running. So I'm sorry about how abrupt this is, but we're all done. Thank you everyone for your contributions, great or small. Kevin and I do appreciate everything you've done, and we'll be sure to put all the data to good use. I'm glad to have been able to help manage this project, even if it's only been one day a week for the most part. The community here has always been a good one. I can try and answer any questions anyone has in this thread - I'm sure there'll be some. Я больше 3-х миллионов успел накранчить за почти 6 лет. 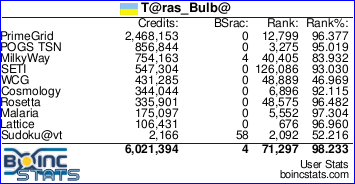 Як тепер прибрати його з boincstats.com? Що потрібно натиснути? Коли настане час, проект сам переміститься в неактивні (завершені). і поруч у стовпчику Опції натисни відповідний "педаль" (той що праворуч). Прикольно, у мене немає третьої "педалі", є лише перші дві. Статистика не має зникнути, бо зав'язана на персональний ID, хоча я не впевнений (треба глянути Help). Якщо натиснеш на другу "педаль", на всіх компах воно від'єднає цей проект. A project can only be removed when there are no hosts attached to the project and when the project is not retired. Removing a project may cause CPID problems when the project retires! Проект может быть удален только при отсутствии хостов подключенных к проекту и, если проект не является отключенным. Удаление проекта из ВАМ! сделает проект неуправляемым на хостах, на которых он установлен!